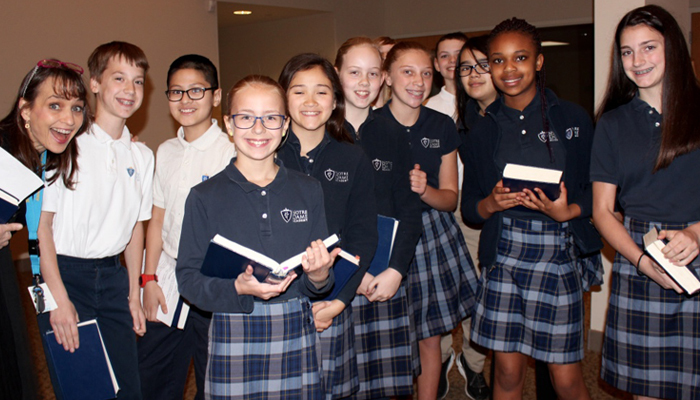 Uniforms are worn at Notre Dame Academy to promote a sense of community and belonging. Our uniform policy helps students remember they are all part of God’s family and are valued members of a remarkable community. Collectively, the uniform policy helps to create our learning culture, laying the foundation for students to grow intellectually, spiritually, emotionally, and physically. All students in grades K – 8 are required to wear uniforms during the school day and on field trips, unless otherwise announced. Our uniform providers can be found online at Land’s End and Educational Outfitters. All PLAID items must be ordered through Lands End; our school number is 900156605. There are gently used uniforms for sale in the school office with items ranging from $1 – $5. Parents are welcome to stop in and look at inventory any time. All donations are appreciated. Students have earned a chance to wear NDA spirit wear during the school year on Friday’s and other days as announced. When wearing NDA spirit wear tops, students may also wear NDA flannel bottoms, or other approved non-uniform day pants. Spirit wear can be ordered online from either of our two uniform vendors. Occasionally, there will be other out of uniform days for holidays, class color day, etc.. On any non-uniform day, students need to follow the out of uniform policy. Collectively, the uniform policy helps to create our learning culture, laying the foundation for students to grow intellectually, spiritually, emotionally, and physically. Occasionally, there will be out of uniform days for holidays, class color day, etc. On any non-uniform day, students must follow the out of uniform policy.